Here’s another Spanish restaurant that plays to the strengths of the deep rooted Spanish cooking traditions I always find so fascinating and delicious. 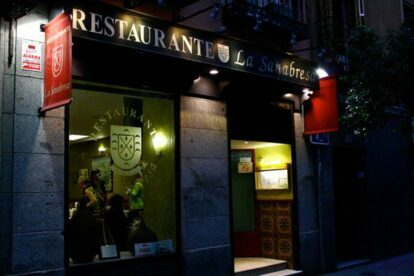 La Sanabresa looks and feels like a very traditional place but with dishes that will make your mouth water long after you leave the restaurant. This is a place I try to visit at least 2 times a month, and since the prices for what you get are so low I could just as well be going here twice a week instead. The place has gotten a huge boost in popularity lately so make sure you call ahead or try to book a table (they usually take bookings for 4 people and up or bigger groups). If you’re really looking for that true Spanish restaurant feeling it’s impossible to go wrong with this place. If you don’t believe me, order the roasted lamb leg, that has been slowcooked for hours in a light carrot broth as well as the deep fried eggplant. Then you will understand what it is that makes this place so attractive to locals in Madrid.